A colleague out hear pointed something over lunch yesterday, which I had forgotten for quite some time. `You guys are world`s largest democracy and most vibrant as well`, he said. I smiled back, not because of pride but because the irony in the line of my new found friend. I smiled because I was silently asking myself – are we really? I never let it be too obvious for this friend to gaze what I am up to but nevertheless the irony that we are still considered as world`s most vibrant democracy by the outsiders seems to be intact. It is not a dispute that we are world`s largest democracy and will remain so unless the Chinese chaps decide to overtake us on that department as well. But are we a `Vibrant Democracy`, let alone being the most vibrant democracy? Your guess is as good as mine and the answer to this complex query is a big, big NO. Though our constitution is a mega `Copy-Paste` job and more often than not used to sell snake oil to its citizens but still is it been respected as it should be? I guess no and a straight forward proof of this is my previous line. Had there been respect for our constitution, I wouldn`t have gone anywhere near terming it as a `Snake Oil supermarket`. But you can`t blame me alone for being so deplorable towards something that describes us as a nation. If I was to be blamed for my foul profane, let’s start blaming all those who made sure that an average citizen like me would end up terming his/her constitution as snake oil. Should we? Let’s start from the latest instance. Now Congress wants all the exit polls and anything to do with poll projections should be banned by the election commission. It is no secret that the primary artifact of a vibrant democracy or for that matter any democracy is its electoral process and elections. So to keep your democracy intact one must ensure that the process of election remains as a rock solid foundation. No chances should be taken when it comes to our elections and that is a must for any democracy around the globe. If the so called poll projections are a genuine nuisance in free-and-fair exercise of our electoral process then they should be shunted out without any further argument. And to be honest, all these projections are gimmicks of our highly uncouth media. A statistics drawn out after asking 4000 people on the street can`t be termed as a pan-India projection. Taking the view of a few thousand people and then painting the entire voters on the same brush will largely remain nonsense for me. They should be banned, not because for the reason why Congress wants them to but because they are a danger to our democracy, in future, if not now. Coming back to the topic. As far as I remember, the business of poll projections goes well back to couple of decades. As far as I remember, Congress was there in our political spectrum when this poll projection nonsense started and they are still now part of our democracy unfortunately. When they were OK with this nonsense for all these years, what happened all of a sudden? What the Congress found alarmingly unhealthy practice for our democracy in opinion polls now, which they surprisingly couldn`t all these years is little astonishing. It is even more astonishing that they never had shown any hint of dissatisfaction on opinion polls, as early as April of this year. So what could have changed in a matter of six months for such staunch objection needs for a detailed analysis. Now here is the thing. How lout our media houses may be but for a vibrant democracy to exist, it requires that the fourth estate remains free and equally vibrant. 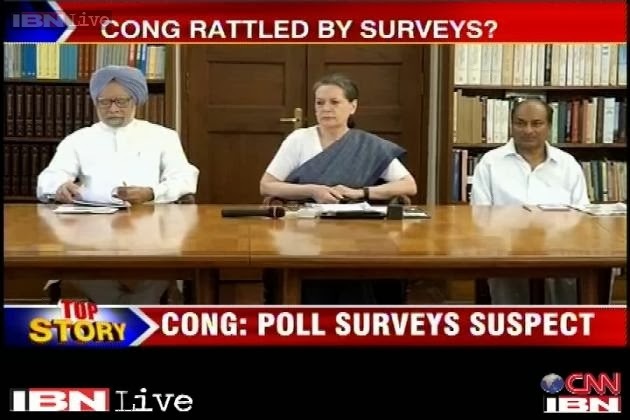 So by opposing the opinion polls Congress is trying to curb this fundamental aspect of democracy. And guess what, the same Congress morons throw their jingoisms vis-à-vis democracy at the drop of a hat. Never mind and let’s analyze further. Cynics here suggest why Congress has to go this route through Election Commission? They could easily throw more bones at the already bought out media and just stop the opinion polls getting aired. But that is a different debate and let`s concentrate on the topic in hand. I think the mistake the media houses did this time around is by having opinion polls at different phases of the year. If I am not wrong with my math, each of our media (except NDTV as they can`t just see their favorite Congress decimating) has at least shown three opinion polls spanning over a period of 8 months. One for the month of April while the next two were for the month of July and October. And remember, when our media were at it, Narendra Modi was anointed as the priministrial candidate of BJP. This is where the problem seems to have started for Congress. There is a stark indication of decreasing, both vote share and seats of Congress between April and October. The difference is as good as about 40 seats in a matter of six months. This in turn reflects the impact of Narendra Modi as the PM candidate of BJP. When the exit polls show a gradual and steady rise of Modi wave, while at the same time their own Rahul Gandhi is chopping out few more seats every time he opens his mouth, Congress is expected to remain anything but sane. The sycophants can`t just fathom that an average tea seller is running away with the show while their own Shezada is flopping more with each of his public appearances. The opinion polls even get more irritating for Congress when they shamelessly have called Modi an average leader with no pan-India presence on the very day of his priministrial anointment. There is in fact more to it than just eggs on their faces. This is something more important for each sycophant of the Congress party than some self-humiliation. They know their Shezada is no match to a certain average tea seller but just want to conceal it from the public as much as possible; even if that means subverting the very ethos of our democracy. This is the precise reason why Congress suddenly finds opinion polls are a danger to democracy. It may be or may not be a danger to our democracy but for sure it is a danger to the false rapport of a below average brat with no achievements to showcase. And that should be good enough a reason for the sycophants to screw the democracy upside down. The country can go to hell but nothing can dare to show the real image of an over hyped IQ less college dropout prince. But are you surprised with this step of Congress? Hell, me neither. Subverting democracy and every democratic institution for self-gain is a trademark of the Congress party. They have a rich history of sabotaging our constitution, democracy and the citizens for personal gain. The history goes back to good 40 years at least. Indira Gandhi was the pioneer in inculcating this shameless vestige among all Congress hacks and no wonder the present lot of frauds within Congress are smartly carrying on this dirty and stinking legacy. When objected to her malpractice and subsequent jail term by the Allahabad court, Indira Gandhi went ahead and declared emergency so that she and her retard son going by the name Sanjay Gandhi can have a free run. Least we talk about the massive loot and subversion of every democratic fine points that went for a year after that is better. Not satisfied with this the shameless woman even curb the powers of our courts and packed almost all tall opposition leaders to jail. What was their crime? Correct – they opposed to the massive loot and mismanagement of Indira Gandhi. Do you think that is all? If only I will tell you, Indira Gandhi even banned Kishore Kumar during that time since he was seen talking openly against such blatant miscarriage of democracy. Now, I feel little worried for Lata Mangeshkar since she did this grave mistake of openly praising Narendra Modi and his style of governance. Hope Lata Tai doesn`t have to go through what the legendry Kishore Kumar had to. Fingers crossed, knowing how rotten Congress can go to safeguard their nefarious personal goals, their loot and of course the false Gandhi family. But ask any Congress joker, he/she will clarify how big believer of our constitution his/her party is. Among all these open disrespect of our constitution and that too by a political outfit in power, we lesser mortals are asked to continue respecting our constitution without raising a question or two. We were told how the constitution defends our nation, our national ethos and individuals like me. Pity I feel on such abject lies since something which can`t defend itself from the louts of a crook party is supposed to defend the nation and individuals like me against the same bunch of crooks. Didn`t I say, it is the avenue of `Snake Oil` selling mechanism? Here is just one example of how exactly it is. What you have written is sad but true. Our country can`t grow until this filthy Congress is completely wiped out. Agreed with You Sir, India will get True Freedom only after getting Rid from this Most Corrupt,Immoral and Undemocratic Party whose only interest is to serve the cause of Dynasty (Mother-Son Duo) at the cost of the Interest of India and Indians. It is really sad to read that "Though our constitution is a mega `Copy-Paste` job and ......". I thought you are a well-read person but seems you are from the breed who understands English very well and think that they are learned people. Who joins politics today? Those who plan to plunder money through various govt contracts. Who nowadays joins to help people or improve the country? I haven't seen anybody for a long time even now. If Congress is the Sachin then i am sure BJP is the Virat Kohli of corruption (Names are only for comparision, no need to drag them into this). One is the Mega Star and the other upcoming super star. Both of them will take their pie of flesh as and when they can and as much as they can. As for AAP i guess we can look at Yedurappa or sharad pawar. Seemingly most honest people before they joined politics. Today they are the epitome of moral corruption. So all this talk of Democracy is no more but just a crass talk. We don't deserve it. I guess it was Winston Churchill who once had remarked that give these Indians there independence and they will even sell water to their own countrymen. Funny but so true. True even he basics are not available to anybody. All of us in are now buying water. Lesser said about sanitation and residence. Where are we going with this? Don't think Namo pill is also going to solve the issues. Only reason NAmo is benefitting now is because of 'HOPE'. Hope he turns out to be the miracle worker. Hope he is able to rid the country out of corruption. Hope our lives will be much improved because of him becoming Prime Minister. Again Hope is something we have been living since independence of a better country. Countries like Singapore, China have already overtaken us and gone ahead in having good roads, sanitation. When will we have good roads? Clean Water for everyone. Houses for all to live. Cops / IT Dept/ Sales Tax Dept/ Land Registration/ Municipalities not asking bribes for everything? Last but not least Join politics to help the countrymen and not to rob them "right royally".